Lock in a great price for Hotel Shallon – rated 8.2 by recent guests! The room was a good size. The heater provided in the room was very efficient and while the temperature was 5 outside, we were sweating in the room inside.. :) The variety in the breakfast was decent. They also allowed early check-in @12, while actual check-in was 2 P.M.
Breakfast was simple, but good. The cakes were great. The bus station is really close (7 min walking distance). Quartos bem conservados ,com camas modernas ,banheiro bom, apenas a pia estava com um vazamento , mas não influenciou no conceito da acomodação . O café da manha é bom com variedades. Atendimento excelente dos funcionários. Funcionários receptivos e café da manhã com bastante variedade de bolos. 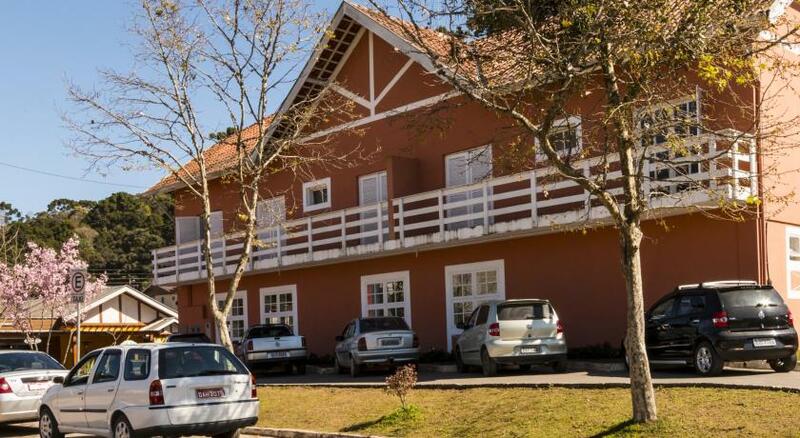 O hotel fica localizado relativamente próximo ao centro de Campos, dando cerca de 5 min. de carro. O quarto em si tem um espaço ideal para poder guardar suas coisas. Hotel Shallon This rating is a reflection of how the property compares to the industry standard when it comes to price, facilities and services available. It's based on a self-evaluation by the property. Use this rating to help choose your stay! Hotel Shallon is only one mile away from the center of Capivari. It offers comfortable rooms with a TV and a minibar. Free private parking is available on site. All rooms of the Shallon Hotel are equipped with a private bathroom and a telephone. Guests can enjoy a traditional colonial buffet breakfast every morning, including various breads, cheeses, petit-fours and pastries. The room service menu features a choice of snacks and homemade soups. Hotel Shallon also offers 24-hour front desk service and laundry service. It’s only 650 feet from several shops, restaurants and bars. When would you like to stay at Hotel Shallon? This room is located on the ground floor or 1st floor and has a colonial decoration. This room is located on the ground floor or 1st floor and has a contemporary decoration. Sitting on the ground floor near the parking area, this room offers a colonial style décor. Located on the ground or 1st floor, this room offers a TV, a mini-bar and a bathroom. House Rules Hotel Shallon takes special requests – add in the next step! Up to two older children or adults are charged 40 % of the room stay per night per person for extra beds. Hotel Shallon accepts these cards and reserves the right to temporarily hold an amount prior to arrival. The size of the room, the smell (like old furniture), the way it looks (everything incredibly old), too noisy, the TV signal was weak and the TV was super small. It was cold and the heater was broken. I feel bad bc the manager tried to be nice, but ended up being too extra... I was getting embarrased bc he was complimenting/hugging too much. The hotel is far from the main street and there's nothing around (except for the choc factory that is nice, but you can visit in 30min), but it's fine if you've got a car. It was too expensive and didn't match mine and my mom's spectations. There are no restaurants close to the hotel and little deserted in the night.